259 pages | 123 B/W Illus. We live in a world where we try to solve similar problems in structurally the same way. But they simply are not optimally solved all the same. Supply Chain Optimization through Segmentation and Analytics addresses the issue of optimizing the planning and scheduling process and asks the question; "Is there a ‘one size fits all’ solution for planning and scheduling?" The answer is a resounding "No!" We migrated through EOQ, MRP, JIT, and TOC, each time hoping to find that one size fits all. Each of these systems looked at the facility as if it had one focused problem, either optimizing work schedules, materials movement, or machine utilization. But what if you have two, or possibly even all three of these problems? Then what system do you use? Or what if your critical resource is not labor, materials, or machinery? Then which planning and scheduling solution do you utilize? This book introduces the concept of segmentation as the planning and scheduling tool that facilitates the optimization of the supply chain. If you have one type of problem in a part of your supply chain, you use the solution that appropriately focuses on that problem. If you have a different problem in a different part of your supply chain, then you use a different and appropriate tool for that part of the supply chain, and so forth. Or, if your product is in different stages of its life cycle, it probably requires a different set of tools for each stage of that life cycle. In addition, the book discusses how to integrate planning and scheduling tools using a segmentation approach that results in a world-class supply chain environment. It clearly details the power of segmentation and offers a systematic plan for implementation in the supply chain. 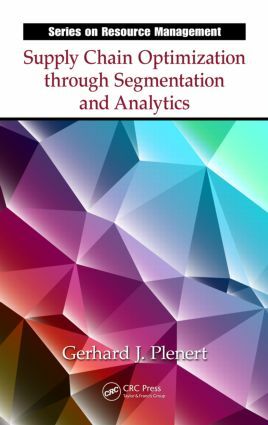 To facilitate this, the author covers the components of an integrated segmentation policy, including the analytics elements and the measures that define segmentation success. He helps you build a strategy and methodology for introducing segmentation principles that allow you to break free from "one size fits all" thinking. What is Segmentation and How Does It Work?